Talk Show News: Jay Leno: How fresh is the comedy? 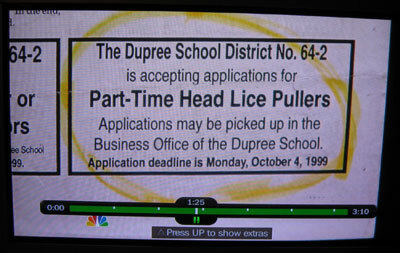 Note the fine print: "Application deadline is Monday, October 4, 1999." Has Leno spent his summer working his way through a backlog of unused clippings that date back to the Clinton Administration, or is this an old fave from the "Tonight" archives that has been dredged up for the commercial? In any case, you'd think someone at NBC would have at least whited out that line to make the joke look a little less musty. Its hard to do, but I admit "Headlines" was something I actually did enjoy from the old Tonight Show. I dont know if the headlines are fresh or not, but that doesnt really matter to me as long as they are funny. That said, its crazy they chose that particular headline to feature on their ad, considering its THAT old and people can clearly see it with their DVRs pausing feature. I guess they thought nobody would even notice or care about the date. But they were WRONG, cuz Talk Show News and its readers DO. Thanks for keeping an eye out for the viewers and their welfare. Being exposed to recycled comedy should be considered torture and illegal. lol. I also TiVo'd "Tonight" every Monday to watch the Headlines segment, and I'll no doubt continue to watch once I figure out when it's airing on the new show. (Jaywalking, on the other hand, I can do without.) But to use a 10 year old clipping as the centerpiece of an ad just seems lazy and wrong. Just wanted to make it clear that I'm not dissing the Headlines concept!